The three-team trade is still up for approval by the Commissioner's Office. JUST moments after we reported that RR Garcia has been put on the trading block, we got word from sources that the Star guard is indeed on the way to San Miguel in a three-team trade that also involves Mahindra. Under the terms of the trade, Star will deal Garcia and Alex Mallari to Mahindra for Aldrech Ramos and a 2017 second-round draft pick (from NLEX). 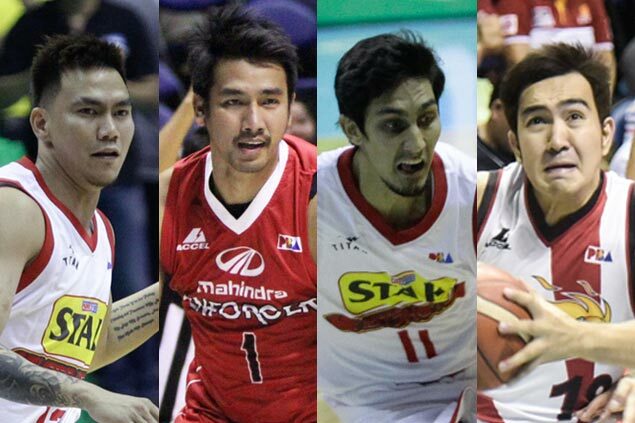 Mahindra will then send Garcia and Keith Agovida to SMB for Ryan Arana and the Beermen's 2016 first-round draft pick. Once approved by the Commissioner's Office, the deal will have Mallari and Arana reinforcing Mahindra, Ramos returning to Star and Garcia reinforcing an already formidable San Miguel backcourt. Bits and pieces of the trade have been reported over the past few days, with SPIN.ph reporting as early as Monday that Mallari is on his way to Mahindra in a trade for Ramos. On Thursday, more details of the multi-team became clearer when SPIN.ph senior writer Karlo Sacamos reported from Star practice that Garcia was no longer told to report by management. Succeeding interviews with Star manager Alvin Patrimonio confirmed a trade was in the works, likely to be sealed by team officials concerned during the PBA board's planning session in Korea. Commissioner Chito Narvasa is also in Korea and will likely approve the trade from there. Meanwhile, sources have confirmed that Garcia has already started reporting to San Miguel practice last Wednesday, confirming the movements in the deal.